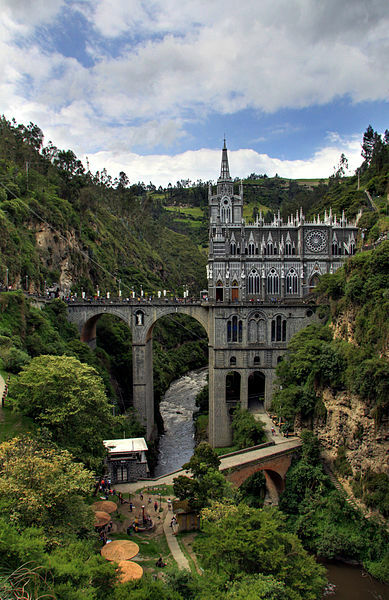 Las Lajas Sanctuary (Spanish: Santuario de Las Lajas) is a minor basilica church located in the southern Colombian Department of Nariño, municipality of Ipiales and built inside the canyon of the Guáitara River. The present church was built in Gothic Revival style in 1949. The name Laja comes from the name of a type of flat sedimentary rock similar to shale. The inspiration for the church's creation was a result of a miraculous event in 1754 when an Amerindian named Maria Mueces and her deaf-mute daughter Rosa were caught in a very strong storm. The two sought refuge between the gigantic Lajas, when to Maria Mueces's surprise, her mute daughter, Rosa exclaimed "the mestiza is calling me..." and pointed to the lightning-illuminated silhouette over the laja. This apparition of the Virgin Mary caused pilgrimage to this location, with occasional miraculous cases of healing reported. The image on the stone is still visible today. The existence of a shrine in this location was recorded in the accounts of friar Juan de Santa Gertrudis's journey through the southern region of the New Kingdom of Granada between 1756 and 1764. The first shrine was built here in the middle of 18th century from straw and wood. It was replaced with a new, larger shrine in 1802, which in turn was extended and connected to the opposite side of canyon with a bridge. The current church was built in the time period from January 1, 1916 to August 20, 1949, with donations from local churchgoers. It rises 100 m high from the bottom of the canyon and is connected with a 50 m tall bridge to the opposite side of the canyon. In 1951 the Roman Catholic Church authorized the Nuestra Señora de Las Lajas Virgin, and it declared the sanctuary a minor basilica in 1954.